CONKLIN/LAC LA BICHE, Alberta (Reuters) – A convoy of evacuees from the Canadian oil town of Fort McMurray drove through the heart of a massive wildfire guided by police and military helicopters as they sought to reach safety to the south of the burning city. Some 1,500 vehicles began making the 30-mile (50-km) trip at 4 a.m. Friday May 6 in groups of 50 cars. The residents had fled to oil camps and settlements north of the city earlier in the week and had to retrace their route through thick smoke on the only highway out of the area as the fire continued to spread. Helicopters hovered overhead watching for flames, and police set up emergency fuel stations along Alberta Highway 63 to keep the line of cars moving. They headed towards safety south of Fort McMurray in towns including Lac La Biche 180 miles (290 km) away and the provincial capital Edmonton. 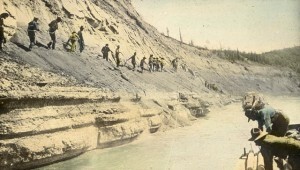 Bill Glynn, who took part in the convoy, told the Edmonton Journal newspaper that he traveled through smoke so thick he lost sight of the car in front of him as they crept through the city. 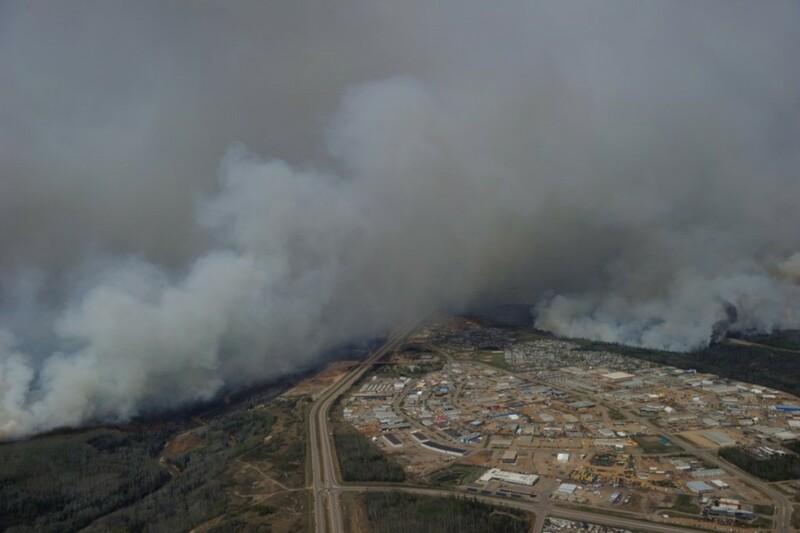 The fire enveloping Fort McMurray has grown to 247,000 acres (101,000 hectares) in Canada’s energy heartland, forcing 88,000 people to flee this week and threatening two oil sands sites south of the city. Winds will push the main fire northeast on Friday, away from town but parts of the city still burned. 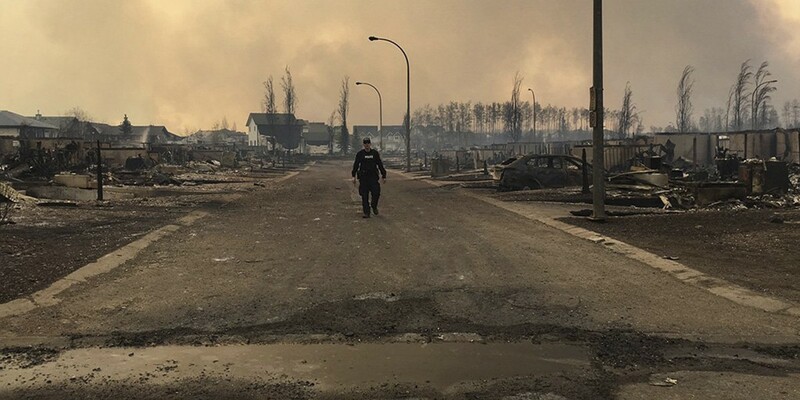 “The city of Fort McMurray is not safe to return to, and this will be true for a significant period of time,” said Alberta Premier Rachel Notley. “So the town site is going to be secured and protected by the RCMP,” she said, referring to the Royal Canadian Mounted Police. The Alberta government has approved emergency funding for wildfire evacuees, and will be giving out C$1,250 ($966) per adult and $500 per dependent. After she and her husband fled in different directions as a wildfire burnt mercilessly through Canada’s Fort McMurray, Erin Naughton faces another difficult task: how to keep her family going until they can return to the city they call home. She fled north to pick up one child, while her husband drove south as traffic and evacuation routes forced them apart on Tuesday. Believing she will not be able to return to her scorched community for months, the restaurant manager is preparing to send her son and daughter to live with family in Edmonton in Alberta, and Victoria in British Columbia, so they can finish the school year, hundreds of kilometres (miles) apart. The wildfire forced 88,000 people to evacuate this week and burnt at least 1,600 buildings in the oil sands city in western Canada. Residents are not likely to return anytime soon, even to assess damage, according to officials. In the evacuation centres in Lac La Biche or Edmonton, south of Fort McMurray, jugglers entertained and a Santa gave out toys, trying to bring smiles to little faces. While some families are sticking together, many others are being forced to consider a fresh start elsewhere – or separate from loved ones – after their homes were destroyed in a city where thousands were already unemployed from the oil industry slump. Suncor contractor Derek Edwards said he may drive his family, including a daughter, 9, and son, 3, across the country to Ontario for work. Suncor has cut production due to the fires and dropping oil prices. He has a job lined up, but is hesitant. Philippines-born Kirby Abo is convinced it is time to leave. Leslie Booker, a mother of two who works in Fort McMurray schools in early childhood development, does not plan to leave. Her house, visible through an online security camera video, has survived. She plans to read and write with her kids, ages 11 and 7, instead of enrolling them in a new school this late in the academic year. 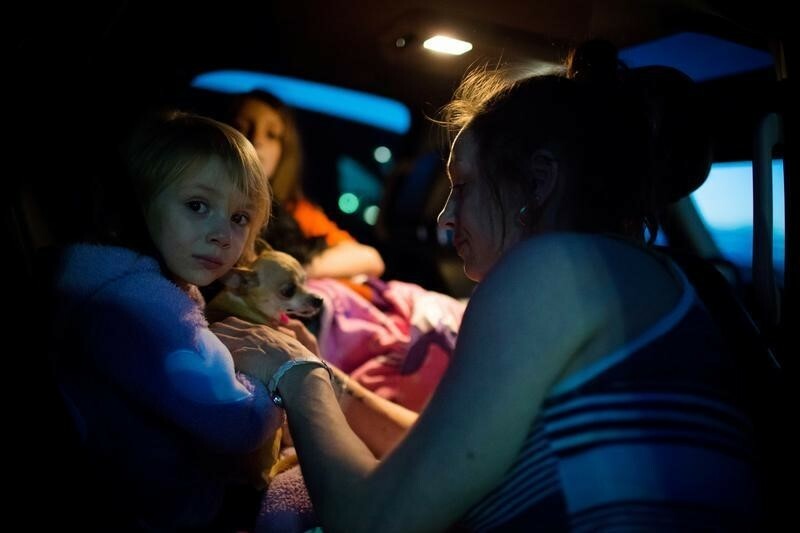 As exhausted evacuees stranded north of the fire-ravaged Canadian oil town of Fort McMurray sped through the only route out on Friday, about one-third of Canada’s daily oil sands crude capacity was knocked out and some pipelines were closed. At least 720,000 barrels per day (bpd) of capacity were offline on Friday, according to calculations by Reuters. That does not include the unspecified reduction in Syncrude output and some other reductions, so some analysts have estimated about one million barrels were shut in. – Suncor Energy Inc, whose oil sands operations are closest to the city, said its main plant 25 km (16 miles) to the north and other assets in the area were safe. It has closed its main mining site as well as its MacKay River and Firebag thermal oil sands operations. It cited the precautionary shut-in of takeaway pipelines and limited availability of diluent. Prior to the fire, Suncor said it was operating at reduced rates of approximately 300,000 bpd because of a turnaround. The main mining site can produce up to 350,000 bpd. Suncor said it expects to promptly return to full production and restart planning is well advanced. Separately, it said Syncrude continues to operate at reduced rates due to limited labour. – The Syncrude oil sands project, owned by a consortium of companies including Suncor, said it was reducing operations to help support employees affected by the fire. 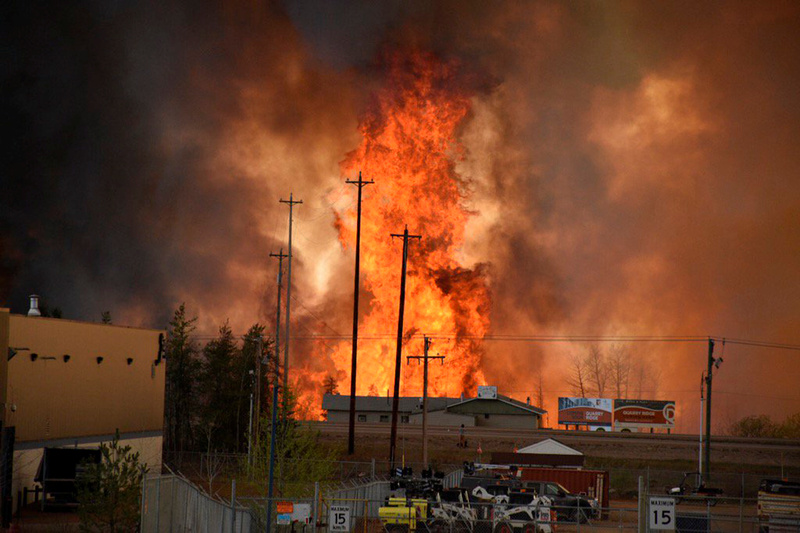 Syncrude has 2,000 evacuees staying at its camp. – Imperial Oil Ltd said that as a precaution, workforce levels at its Kearl oil sands mining project have been reduced to essential staff only. Production has been reduced by an unspecified amount. It said its physical plant is unaffected by the fires. – Athabasca Oil Corp said it shut the Hangingstone project and evacuated all personnel. The fire front is estimated to be within 3 miles (5 km) of the Hangingstone site. – Statoil ASA said production at its Leismer oil sands project has been cut by 50 percent to 10,000 bpd to preserve supplies of diluent, which is added to viscous oil sands bitumen so it can flow through pipelines. – Canadian Natural Resources Ltd said there were some operation outages at its Horizon project, but current operations are stable. – ConocoPhillips said it shut its 30,000-bpd Surmont operations and evacuated people and workers from the site. – Nexen Energy, a wholly owned subsidiary of China’s CNOOC said late on Wednesday it was shutting its Long Lake oil sands facility. Long Lake can produce about 50,000 bpd of synthetic crude but has been operating at reduced rates since late January, when an explosion at the plant left two employees dead. – Royal Dutch Shell Plc said it closed its Muskeg River and Jackpine oil sands mines, whose combined capacity is 255,000 bpd. – Husky Energy said it cut production at its Sunrise oil sands project to 10,000 bpd from 30,000 bpd after a pipeline that supplies the project with diluent was shut down. – Connacher Oil and Gas Ltd said on Thursday it was bringing its Great Divide production back up to 8,000 bpd, after cutting it to 4,000 bpd on Wednesday. Great Divide is 80 km south of the city, and produced 14,000 bpd in the fourth quarter. – The following oil sands companies with operations in the region said they were not affected: Cenovus Energy Inc, MEG Energy Corp and Japan Canada Oil Sands Ltd.
– Enbridge Inc said it shut all pipelines in and out of Cheecham Terminal on Wednesday evening. The Cheecham facility was evacuated and the Athabasca Terminal reduced to a minimum staff for safety reasons. Line 19 south of Kirby Lake continues to operate, it added. – Midstream energy company Keyera Corp said its South Cheecham rail and truck terminal, 75 km (47 miles) south of Fort McMurray, has been evacuated and shut down. South Cheecham is a joint venture between Keyera and Enbridge. – Inter Pipeline Ltd said on Thursday it reopened its Polaris diluent pipeline to the Fort McMurray area and is ready to reopen its Corridor pipeline system that serves Shell’s oil sands facilities when that operation reopens. No pipeline assets incurred significant damage as a result of the wildfires. – TransCanada Corp said it does not expect the wildfire to affect deliveries of natural gas. The nearest pipeline is about 20 km (12 miles) west of the current wildfire.